Recipe 34: Today a special dish recommended by my father instead: the milky rice. I have to say the true…i have never tried it before but he use to eat it when he was a child, thanks to my grandma. Basically i have always done a very weird face every time my father was speaking about this rice, but because this week we have lots of milk to use, i ask my parents what i could cook and my father convinced me to try it… and i liked it a lot. Ok, it’s a bit heavy because basically is like to eat rice and besciamella, but now i understand why he was crazy for that. The recipe is very easy is usual. Here are the ingredients for 2 people: 140 gr of rice, 800 ml of milk, some salt, 10 gr of butter, nutmeg and 20 gr Parmesan cheese. That’s all! Take half of the milk and bringing almost to boil. Here I added some salt too. Take the other milk hot in a pan on very low fire. When the first pan with milk is almost boiling, add the rice and let it cook until it absorb all the milk. Mix always to avoid the rice to stick and turn down the fire for a slow cook. When the rice has absorbed all the milk, add the other hot milk and keep on stirring. The rice will take around 20 minutes in total to get ready and thick. 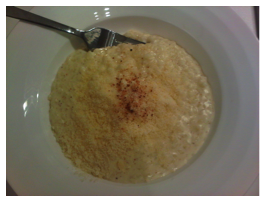 Add some nutmeg and keep on mixing until the rice is ready reaching a risotto consistency. At this point add the butter and when all melted, serve it in a plate with some grated parmesan and some pepper. Enjoy! Ps. Papa’ finalmente ho provato I’ll riso di cui tanto parli sempre e devo ammettere che e’ buonissimo! Ci credo che da piccolo ti piaceva, sembra riso con la besciamella! Penso che una volta ci provero’ a fare dei tortini al forno devono essere deliziosi!